If you want high impact without all the trouble of extensive renovation, consider installing a wood fence this spring. 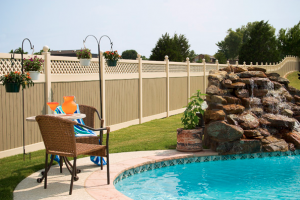 You may want to do something to spruce up your home this spring that is relatively inexpensive and noninvasive, and a fence makes a huge difference. If you want high impact without all the trouble of extensive renovation, consider installing a wood fence this spring. Wood fences offer numerous benefits to any homeowner and property. Wood fence has a timeless classic look that is an undisputed favorite. While trends often come and go, you don’t have to worry about a wood fence looking outdated in a year or two, after you invested money and time into. Wood fences are universally appreciated for their charm. Compared to many other fence materials, wood fence is quite affordable. It is also commonly a DIY project for the savvy enthusiast with some extra time on their hands. With regular upkeep, a wood fence can truly stand the test of time, and much of the maintenance they require is not expensive or inconvenient. Fences offer invaluable safety and security benefits, particularly if you have kids or pets. If you do not have the time to walk your dog everyday, and enclosed yard is a must in order to keep them safe from traffic, strangers, and other unruly dogs. Young children can also often be curious and too trusting, and wander into trouble and danger if they are not kept under close watch. A fence not only keeps strangers out, but keeps them in a safe space where they can play and enjoy the outdoors without you worrying about a thing. This will be especially lovely as the weather warms.